We remember the fall of the Berlin Wall in 1989 because it was such a perfect metaphor—­joyful Germans running into each other’s arms as an entire system crumbled, lighting the night with relief and exhilaration. On November 9, the world celebrates the end of communism and the liberation of millions from decades of ­oppression. Today, few remember the years of patient effort by dissidents and activists from Warsaw to Budapest that set the stage for that momentous night. Even in the German Democratic Republic (GDR)—commonly known as East ­Germany—­the beginning of the end happened not in the divided capital of Berlin but in lesser-known cities such as Leipzig, Dresden, and Plauen. In the tumultuous 20 years since the end of communism in Germany and Eastern Europe, the focus on the images of that single night has made it hard to recognize just how much work is necessary for a democracy movement to ­succeed. In East Germany, more than in almost any other country in the communist bloc, the events that became synonymous with the end of communism were the fruit of a protest movement that began years before with no hope of toppling the regime. There was no great symbolism or strategy. The movement’s greatest ambition was to force East ­Germany—­which became one of the communist bloc’s most ­hard­core regimes after its founding in the ­Soviet-­occupied zone of Germany in 1949—to live up to its own ideals. No one imagined bringing down the Communist Party, much less reunifying ­Germany. If you had to put your finger on one thing that opened the first cracks in the wall, it might be the American Pershing II missile. When in 1978 NATO announced plans to deploy ­mid­range nuclear missiles in Europe in response to the Soviet nuclear ­build­up, activists on both sides of the divided country protested the idea of nuclear weapons on German soil. While hundreds of thousands signed petitions and rallied in the West, in the East the protests were used for propaganda purposes by the communist regime, which was happy to see people spontaneously protesting against the United ­States. But as the peace movement in the GDR grew, it began asking hard questions about the situation at home. Protestant churches were officially tolerated, though cut off from their counterparts in the West and under constant scrutiny by the authorities. Nonetheless, the church became a safe space for the peace movement, and many ministers organized prayers for peace and rallies against militarization, military classes in grade schools, and mandatory army ­service. “The government told us Pershings and cruise missiles were the tools of the devil, but [Soviet] SS-13s were doves of peace,” Eppelmann says. “It was a chance for us, as people in the GDR, to stand up and say something about the course of GDR politics and the nuclear arms race.” Peace protesters turned propaganda on its head. “Swords into plowshares”—the subject of a sculpture given as a gift to the United Nations by the Soviet ­Union—­became a slogan. Teenagers sewed patches bearing a stylized image of the sculpture onto their jackets, only to be threatened by teachers and ­police. In the tumultuous 20 years since the end of communism in Germany and Eastern Europe, the focus on the images of that single night has made it hard to recognize just how much work is necessary for a democracy movement to ­succeed. Once the peace movement turned critical of the GDR, it had outlived its welcome, and activists found themselves watched and persecuted. The one safe haven was the church. Around the same time Eppelmann was writing his Berlin Appeal, Christian Führer and Christoph ­Wonneberger—­two young pastors in Leipzig, East Germany’s ­second-­largest ­city—­began holding regular Monday evening prayers for peace at the St. Nicholas ­Church. Looking back, activists remember a mixture of exhilaration and fear. Sitting in his office at the Forum of Contemporary History in Leipzig, museum historian Uwe Schwabe—a friendly, garrulous man with a long ponytail—remembers feeling transformed when he started attending Monday meetings at St. Nicholas in 1984. He was just out of compulsory service in the East German army. “At 22, I experienced young people talking freely about politics for the first time,” he recalls. That freedom could be costly: Attending church, let alone prayer meetings, could mean the end of careers or blackballing by universities. Under pressure from the authorities, attendance at the Monday peace prayers shrank to fewer than 10 regulars by the mid-1980s. Gathered in the chilly, centuries-­old church in the city’s center, under constant surveillance, they could hardly have been called a movement, much less a ­threat. Leipzig’s Monday meetings were a sort of North Star in a rapidly growing constellation of ­reform-­minded citizens’ groups. The thaw was accelerated by events beyond the borders of East Germany. Mikhail Gorbachev came to power in the Soviet Union in 1985, and soon began to implement reforms that gave hope and energy to people all over the Soviet ­bloc—­and exposed the inflexibility of their own leadership. After all, if the Soviet Union, long heralded as the model society by communist parties around the world, was loosening up, why couldn't East ­Germany? At the same time, warming relations with the West gave East German activists more breathing room. (GDR head of state Erich Honecker made his first official visit to West Germany in 1987, and was intent on securing an invitation to Washington.) Jailing prominent dissidents brought quick condemnation from the West, for example. By 1989, Stasi agents were monitoring nearly 200 separate citizens’ groups pressing for reform on issues ranging from the environment to travel ­restrictions. The thaw was accelerated by events beyond the borders of East Germany. Mikhail Gorbachev came to power in the Soviet Union in 1985, and soon began to implement reforms that gave hope and energy to people all over the Soviet ­bloc—­and exposed the inflexibility of their own leadership. Much of the unrest was apolitical, but any challenge to the status quo was implicitly a challenge to the ruling party. 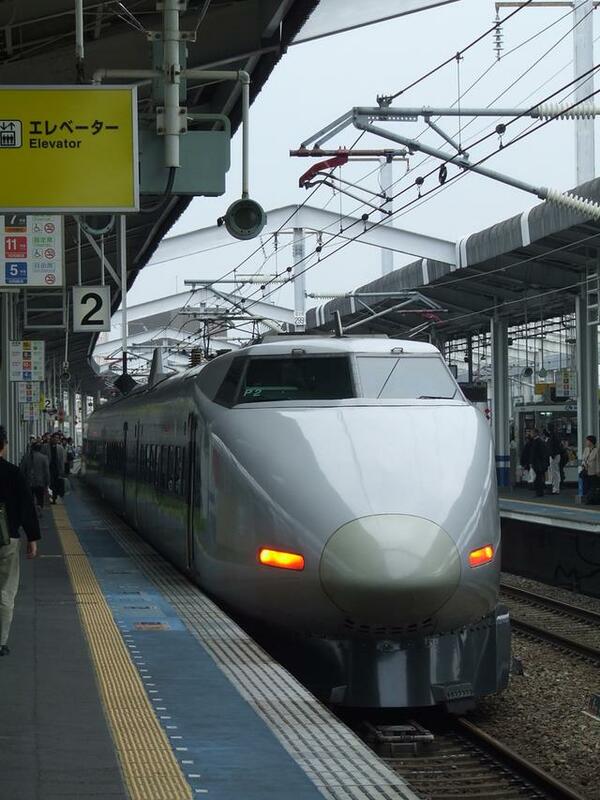 Still, the popular mood was changing fast. “Normal people were fed up,” says Berlin historian Jens Schöne. “They didn't want to wait 15 years for a car, they didn't want to work in a factory; they wanted to be able to travel and buy things.” The fact that the regime never managed to block West German television broadcasts meant that an entire generation of young people born after the 1968 Soviet crackdown in Prague wanted the lives they saw beamed into their living rooms every ­night. In 1987, Schöne remembers, the Stasi scrambled to clear the streets of East Berlin when a David Bowie concert in West Berlin prompted hundreds of teens, angry that they couldn't attend, to gather and chant, “The wall must go.” A year later, the Stasi deployed agents to monitor Michael Jackson while the singer was in West Berlin for a ­concert. Local groups heading out to plant trees or clean up riverbanks found themselves blocked by police and scrutinized by the Stasi. After a restless spring, summer brought a grim warning of where things could head. In early June, Chinese tanks and soldiers moved in on unarmed pro-democracy demonstrators gathered in Beijing’s Tiananmen Square; hundreds were killed. For older East Germans, the events in Beijing were no surprise. Those who had lived through World War II remembered the cruelties of the Soviet occupation. And there were more direct parallels. In 1953, workers in 700 East German cities declared their opposition to the Unified Socialist Party of Germany, or SED, the party that was synonymous with the East German state, and demanded the reunification of the country. Soviet soldiers fired on demonstrators, and more than 100 were killed. In the years since, all opposition movements in the Soviet bloc had met the same fate: “’53 in Germany, ’56 in Hungary, ’68 in Prague, ’89 in ­China—­that’s how communism dealt with critics,” ­Führer says. In the wake of Tiananmen, a different kind of fear pervaded the Monday peace prayers. Egon Krenz, who soon would succeed Honecker as SED party leader, visited Beijing days afterward and praised the way the Chinese government had rescued communism from “counterrevolutionary elements.” In Leipzig, fear of a “Chinese solution” grew. “People had seen the pictures from ­Beijing—­it wasn't at all clear this would be peaceful,” says ­Schöne. But behind the scenes, the Soviet Union’s dynamic party secretary made it clear to party leaders throughout the bloc that the Soviets were no longer interested in intervening in the domestic politics of their neighbors and client states. Despite the presence of nearly a million Soviet soldiers in East Germany, Gorbachev’s message was clear: You’re on your own. Poland held free elections in June that resulted in a landslide for the Solidarity opposition. Hungary had relaxed border restrictions with Austria and begun its own process of peaceful democratization in the ­spring. For the first time, East Germans who wanted to emigrate could make an end run around the Berlin Wall. All summer, thousands of them voted with their feet, fleeing west via Hungary to Austria. Thousands more abandoned their cars on the streets of Prague and climbed over the fence around the West German Embassy, seeking ­asylum—­a feat previously attempted by only a trickle of East Germans over the years. By the end of September, 4,500 were camping on the embassy grounds despite temperatures in the ­90s. After a summer break (some things in Germany are sacred, no matter the political situation), thousands of people showed up at the St. Nicholas Church on Monday, September 4. In view of Western television cameras in town for a biannual trade show, young protesters in front of the church unfurled a banner demanding freedom of travel. “The Stasi ripped it down and tackled the kids,” Führer remembers; millions of East Germans saw the scene broadcast on the news the next ­day. A new slogan entered the East German vocabulary: “We’re staying here.” A week later, the numbers at the church doubled. This time, almost 100 people were arrested and the city center was nearly shut down by the secret police. Too late: Fanned by West German television, the flames had begun to spread. The same day, “Monday Demonstrations” inspired by Leipzig’s peace prayers were held at Lutheran churches all over East Germany. A movement eight years in the making was growing ­exponentially. Grasping at straws, government officials gave permission for the embassy refugees in Prague and Warsaw to take special, closed trains through East Germany to the West—­and slammed the borders with Czechoslovakia, Hungary, and Poland shut. East Germans were now truly prisoners in their own country. On October 3, word got out that trains full of embassy refugees would be stopping in Dresden on their way west. Thousands de­scended on the city’s train station in an attempt to board what they saw as the last train out of the GDR. “Closing the borders was like putting the lid on a boiling pot,” Hol­lit­zer says. ­Full-­fledged street battles broke out between police with clubs and water cannon and ­stone-­throwing rioters trying to reach the trains; dozens were ­injured. Long-­planned 40th-anniversary celebrations in East Berlin occurred just four days later, on a Saturday. A ­counter-­rally swelled to thousands, who marched spontaneously through the middle of the city during the official parade. As they entered a residential area a mile or so north, police and the Stasi swept in, beating and arresting hundreds of people. In Plauen, a bleak industrial town near the Czech border, police used water cannon to break up a crowd of 10,000 gathered peacefully in the main ­square. Because of the way we remember the fall of the wall, we’ve assumed ever since that the sudden end of an unpopular ­regime—­in Serbia, in Iraq, in Ukraine, in ­Georgia—­is enough to replicate the successes of 1989, and that the institutions and attitudes that form the basis for civil society can be created overnight.For the same reason, opposition movements that don’t succeed immediately tend not to garner much lasting ­interest. At 3 pm on Monday, Schwabe made his way to the church through an eerily empty city. “It was like the calm before a storm,” he says. At five, nearly 8,000 people crammed into St. Nicholas. Three other downtown churches opened their doors to accommodate the ­overflow. In the weeks that followed, there was chaos behind the scenes in East Berlin as the party tried desperately to save itself. Many of the SED’s ­hard-­liners were pushed out of their leadership positions in the hopes that a compromise with the opposition might be made. But the dam had broken. 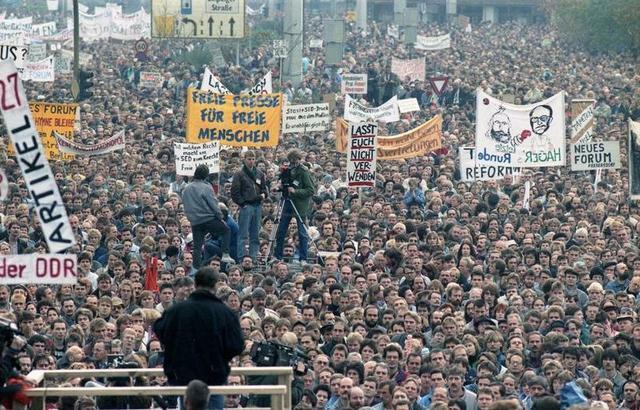 On October 16, a procession of 150,000 people marched around Leipzig’s ring road; the week after it was 300,000, the crowds of Leipzigers joined by people from all over East Germany. On November 4, more than 500,000 people flooded Alexanderplatz in East Berlin. After the drama of the Monday Demonstrations, the fall of the wall was an anticlimax. On November 9, the day after a party congress designed to get the SED back on its feet and reclaim control, a routine press conference was called to announce the party’s latest decisions. As the conference drew to a close, an Italian journalist asked Politburo member Günter Schabowski if there would be any changes to the repressive East German travel restrictions. Flummoxed, Schabowski said that as far as he knew all restrictions were being lifted immediately. His casual announcement on live television sent thousands to Berlin’s border crossings on the night of November 9, where confused, overwhelmed guards stood back and let people ­through. After the heady days of opposition, the sudden collapse came as a shock. Even then, reunification was unimaginable. 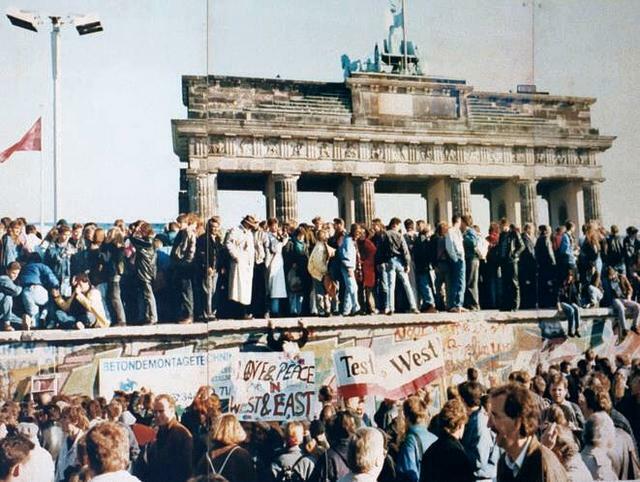 For the dissidents who had been filled with hope at the sight of East Germans rallying to their cause, the fall of the wall was initially seen as a huge setback. “We were disappointed,” Schwabe admits. “We thought everyone who would help us change the country would leave, and there would be no reason to come out on the street.” A friend of Eppelmann’s made it a few hundred yards across the border that night before panicking and running back to East Berlin, afraid the entire scene had been a Stasi trick to get rid of troublemakers so the door could be closed firmly behind ­them. Of course, we know now that November 9 was merely the end of the end. Within a year, the two ­Germanies—­divided for almost half a ­century—­were united again, and communism was a relic. But because of the way we remember the fall of the wall, we’ve assumed ever since that the sudden end of an unpopular ­regime—­in Serbia, in Iraq, in Ukraine, in ­Georgia—­is enough to replicate the successes of 1989, and that the institutions and attitudes that form the basis for civil society can be created overnight. For the same reason, opposition movements that don’t succeed immediately tend not to garner much lasting ­interest.